Armagh, Banbridge and Craigavon have drawn up detailed plans for the Columbcille side of the river as it flows into the lough. SDLP Cllr Declan McAlinden welcomed the regeneration scheme. 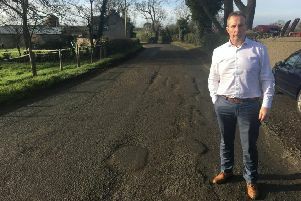 Cllr McAlinden, who has family on both sides of the Bann River, had put forward a Notice of Motion last year asking for the Council to refurbish the area. Though the motion was defeated by the council at the time, Cllr McAlinden said he is pleased Council has listened to the local community. Cllr McAlinden said: “It is welcoming news to receive reports from council about the proposed regeneration of the Columbkille side of the Bannfoot. It follows my disappointment that my council colleagues voted against my motion for council to investigate, in partnership with the statutory agencies, to consider and develop access to the area. There has been a campaign for a number of years to build a footbridge at the Bannfoot to reunite families and create more tourism for the area.